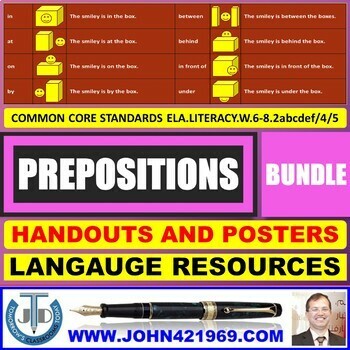 A bundle of handouts on prepositions. DIALOGUE WRITING: This was easy to use. It helped my students to review and fix the errors they were making in their writing. –Beth G.
CAPITALIZATION RULES: The perfect visual to help students remember to use capitalization while writing. – Mary Z. ACTIVE VERBS: This is a great resource to include in the binders for future resources. - Patricia O.
FICTIONAL STORY WRITING: A great resource for students to practice writing during center. - Jamie S.
NOUN PHRASES: This product was helpful for my ELD students! – Rae E.
PLAY-SCRIPT WRITING: Can't wait to use this when I get back. Just love the approach to learning script writing skills. – Kathryn A.
HOMOPHONES-HOMONYMS-HOMOGRAPHS: Very excited about using this in my intensive reading classes. – Tammye G.
COMPOUND-COMPLEX SENTENCES: These task cards were perfect test practice! - Michelle P.
PUNCTUATION WORKSHEETS: I found the variety of options to be useful,… I have used it to complement the areas of focus in my lessons. - Dianne P.
SUBJECT-VERB AGREEMENT: I have used this resource several times already. –Jean C.
OXYMORON: This is great. I can't wait to use it with my ESOL students. - Rebecca D.
SEVEN AGES OF MAN: This was perfect use of imagery and words. It helped even my weaker 6th graders understand the message of the poem and complete an activity on their own. - Amy B.
PREPOSITION TYPES HANDOUT: My students loved this poster. - Patricia O.
PLAY-SCRIPT PRESENTATION: This looks awesome! I am excited to use it with my advanced theater class this year! - Kimberly R.
THE HIGHWAYMAN POEM ANALYSIS: AWESOME resource! I highly recommend this product! – Samantha L.
STORY ANALYSIS HANDOUTS BUNDLE: Looking forward to using this extensively in all levels of my classes. - Olivia Fulmer. READING COMPREHENSION LESSON PRESENTATION: I love it and can't wait to use it. - Vivian W.
ADJECTIVE PHRASES WORKSHEETS WITH ANSWERS: Perfect for what I needed. - Laura T.
Please go to your My Purchases page (you may need to log in). Beside each purchase, you'll see a Provide Feedback button. Simply click it and you will be taken to a page where you can give a quick rating and leave a short comment for the product. Look for the green star next to my store logo and click it to become a FOLLOWER. You will now receive email updates about this store. Be the first to know about my new discounts, freebies, and product launches. Save 30% on this BUNDLE! Note: These are also sold separately!